Watersports centre specialising in sailing, kayaking and rafting. Lessons available. Children and groups catered for. Boat hire also available including catamarans, speedboats, fun boats and canoes. March to November. 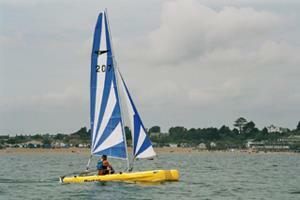 Range of prices for lessons starting from £35 per adult for one hour to full sailing courses at £200 per head. Concessional rates are available for children. Hourly rates for boat hire vary through the season. Can be found at the village end of the main beach in Abersoch.